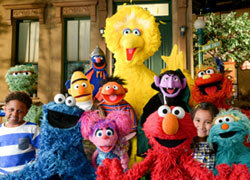 Discussion in 'Classic Sesame Street' started by MIKEB97, Feb 2, 2003. Man, last night I had this bizzare SST themed dream. I was standing at the edge of this park full of homeless people, and right across the road there was this massive shopping mall that had a big red sign that said "SESAME STREET" and an arrow pointing inside. And all through this I heard 3 or 4 different SS themes, and I heard the calypso one, and I was all like "Oh yeah, I remember this". Then I woke up and wondered if it was possible to have nogastalga in a dream. Definetly The early 90's sesame street. Boy, Gina was still working At Hoopers and Met Savion,Around The Corner,and Maria's hair is short. Then, I went outside and met Savion(Without the dreads), He taught me a ffew tap lessons and I was fall off the right foot. Now, i JUST A GROUCHY LIKE OSCAR CALLING Maria "Skinny", Bob" Bright Eyes" and Gordon"Curly". I just help Luis with the toaster at the fix it shop. Not Even Maria is taking care with Gabi. Life in the early 90's sesame street is just a blast! Had another strange SS-related dream last night. I was browsing on YouTube, and found a strange version of the "I-Beam" clip, which involved it being mostly the same, but at one point as the music was continuing, it cut to Oscar the Grouchsaying "Now this is MY kind of thing!" or something like that in a dark setting (presumably the foundry), and then at the end of the segment after the dramatic pause and music end, a voice that sounded like Luis said "I." It was supposed to be a "tamer version" according to SesameWorkshop. Last night, I had a dream about the Mad Painter. It was the sketch where he uses blue icing to make a 6 on a cake. But in my dream, he had to enter a highly guarded mansion to get to the cake. I think he got in by stealing someone's identification paper when no one was looking, then showing it to the guard. But what are you gonna do lol. 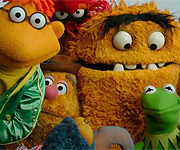 Last night, I had a dream where I passed by an actual street named Sesame Street and while I was passing by it, some of the Sesame Street Muppets were already there waiting for me. Also, there was a mashup of some of the theme songs of Sesame Street including the classic ones. I dreamt that me and a Count puppet sang "We are Number One" from LazyTown. I could see Matt's Count doing that one. MikaelaMuppet and Luke kun like this. I remember when we got to the "Look at this net" part, I grabbed a real net out of hammerspace and threw it on the puppet! I had extremely disturbing Sesame Street dreams as a child. 1) Once, I had a dream about Monsterpiece Theater: The 39 Stairs. The sketch had already scared me as a child EXTREMELY, but this one night, I had a dream about the sketch. Nothing more. Just the plain sketch. I was sleeping at the top of a bunk bed at the time, with nobody at the bottom, so I had a nosebleed overnight, rolled off the bed in my sleep, and woke up to have a fever. Strange what dreams can do to you, isn't it? 2) I was watching a bunch of Sesame Street VHS tapes at my parent's friends house. Then, one of the tapes sucked me into the TV. I was stuck in a very tight air vent, with the original 1968 Cookie Monster climbing up in the front, and the original Fuzzyface Grover in the back. They both had very heavy gruff breathing, but I tried not to get attacked. We got to the top, and there was a huge muppet party. I have no memory of what happened after that other than I went down the vent with them again. 3) I was in a very empty house. Cookie Monster was sleeping upstairs, and if I woke him up he would chase me until he gets me and I die or something idk. I made one slight whisper. Cookie Monster screams with his gruff voice and comes down the stairs with the most scariest angry face you can ever imagine. I headed straight out the door, and went down a huge hill's sidewalk with weird grocery and repair shops on each side. I found my mom in a parking lot unexpectedly, and asked her if I can get in her car. Cookie was catching up and I couldn't explain what happened, so I got in and told her to drive as fast as possible. I don't know what happened next. Those are majorities of them. I wouldn't call them dreams, but nightmares. A few years ago I had a dream... It was a very rainy (and cloudy) day and I was in a tiny cottage. I think I had a few characters staying to eat soup or something??? I was in the kitchen, which had yellow walls with a white counter. The kitchen, I remember, was quite small, and no wonder, for it was a cottage. Then Cookie told me something like, ''Well, I'm going to Sesame Street now.'' I suggested he take an umbrella, and he declined the offer. He went out the kitchen door, to which, when you looked out of its window, you could see a wide grassy hill, almost like an arboretum, to your left, and in the near distance, some woods to the right. He walked a stone path into the woods and went on his way. I don't know why, but to this day, that scene still holds some sentiment to me. It's just so emotional. But, I had never been in this cottage before in my life, let me tell you that. I had a crazy yet awesome dream a few nights ago where I got to meet the behind the scenes people of Sesame Street and a few other puppet shows such as Bear in the Big Blue House, Oobi, ALF, etc. I think Jeff Dunham may have been one of the puppet-related people I met in my dream as well. There was also some guy holding this one puppet creature there that I'm almost positive my mind made up as a "dream exclusive OC". He was some brown Gremlin-looking critter with a really cute face that looked almost like that of an Ewok. He also had green eyes and a long stegosaurus-like tail. I'm pretty sure I may have been at some convention when all this happened in the dream. I had a dream recently that Ernie was hosting Saturday Night Live. When I was little, I had a dream where Hoots the Owl was my substitute music teacher. I think Lisa Simpson was in that dream too, probably because of how she plays the saxophone too lol. But I haven't had any SS-related dreams in recent memory however, the only pop culture related dream I can recall lately involved my family inviting Slenderman over for the Thanksgiving dinner. No seriously! As crazy as that sounds, I still have a laugh every time I think of my dream self passing a bowl of mashed potatoes over to Slendy.